Customer service has always been a core value at JR Race Car. We are here to support the junior community with advice and suggestions about all makes and models. Our tech line is open Mon - Thu 8am-5pm and Fri 8am-noon. Check back often for new and updated tech articles. Don't forget to print them off and take them to the track. Rebuild or new engine ware in procedure. These are recommendations for JR Brand Engines. Carburetor tuning indicators guide. 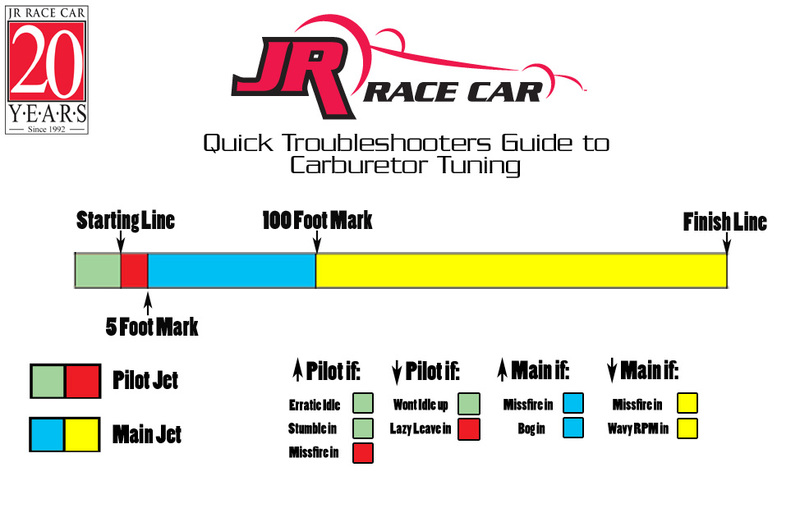 A quick chart the suggest carburetor adjustments. The Mikuni round fuel pump is not as simple to install as other pumps. This is a guide for plumbing the round fuel pump. A how to guide to setting timing for analog ignition coils without a flywheel key. Proper engine cut off is a critical safety component of any dragster. This is a guide to setting up both electrical and manual engine kill switches. Engine basics, a diagram showing all the parts and components to a Titan engine. The basic layout is consistent with all flat head engines. Please print this form out and send it in the box with your engine for rebuild. A peace and part guide to the Shockwave clutch. Weight and spring combinations for the Shockwave family of clutches. History and application for the C-4 style flyweight. Application of the C-14 style weight developed for outlaw racing. History and application of the overdrive H-1 style flyweight. History and application of the original overdrive C-2 style flyweight. How to guide for installing the JR PRO floating caliper on the Hercules chassis. Torque spec and setup information on JR Beacklock wheels. Exploded center pull motor plate view with part list. Chassis ballets, where to pack on the pounds to effect tracking, reaction time, and more. Side by side comparison guide for front and rear tires. Actual measurements and sizing.